Norberto Bianco is a physician and specialist in traumatology. During the military dictatorship, Bianco was an army doctor at the Campo de Mayo Military Hospital. The Hospital was home to a clandestine maternity ward, where pregnant "disappeared" women, held at the Campo de Mayo concentration camp as well as other similar camps, where taken to give birth. According to the testimony of numerous physicians and nurses, Bianco had a key role in the transfer and attention to the disappeared women taken to the Hospital. The disappeared women were tied to their beds, and kept blindfolded during their whole stay there, including the births. Norberto Bianco has two adopted children, Carolina and Pablo. The children are likely to be those of disappeared (and later killed) women who gave birth at the Campo de Mayor Hospital. Bianco and his wife admit that the children are not theirs, but they deny that their real mothers were disappeared. In the 1980's, Bianco and his family had fled to Paraguay to avoid DNA tests being conducted on their children. The Paraguayan courts acted slowly, and the children were able to get married as teenagers to stop the courts from ordering DNA tests. They do not want to acknowledge the possibility that their real parents might be disappeared. Bianco and his wife were finally extradited in 1997, and put in prison on charges of kidnapping and forgery of official documents. 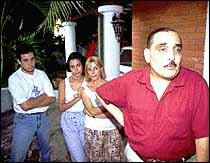 They were later released by the Appellate Court which ruled that the whole time Bianco was in Paraguay he was deprived of his freedom, and thus he had already served his sentence. This, despite the evidence that while in Paraguay Bianco was able to move freely. Bianco has also been charged in the criminal procedures against Argentine military in Spain. Pablo may be the son of Abel Madariaga and Silvia Quintela. Silvia was disappeared when she was pregnant and taken to the Campo de Mayo concentration camp, where she is said to have given birth to a baby boy around the date when Bianco registered Pablo as his son. Pablo may also be the borther of Juliana Garcia, whose mother Beatriz Recchia was also disappeared while pregnant and supposedly gave birth to a baby boy in Campo de Mayo. .
Carolina might be daughter of Domingo Mena and his wife Ana María Lanzilloto. After he was released, Bianco joined the private clinic Buen Ayre and was re-admited by the Buenos Aires Medical Board.